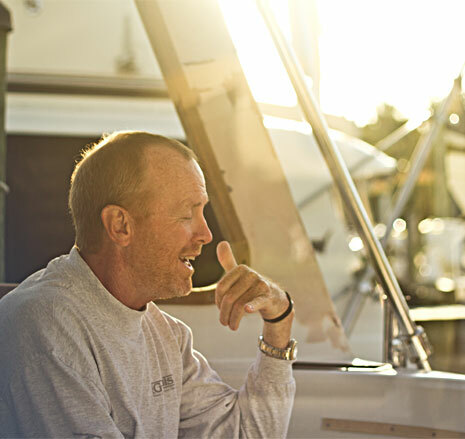 We find that most Huckins owners are passionate and vocal about their love for our boats. Blake is no exception. "The thing that I always say about this boat is that it's incredible," says Blake. “When people get on this boat they’re just amazed. And when I take them for a ride, they are especially amazed." I was on my way back from Tampa Bay, just motoring along, going towards the Sunshine Skyway Bridge and—all of a sudden—we developed a shake in the boat that continued to get worse. I reversed the engine and looked in the engine room, but everything was running perfectly. So, I started back up until we were cruising at about 23-24 knots. It was riding really nicely, but then it got much worse, and suddenly, there was an explosion. It sounded like a cannon was shot off, and scared the you-know-what out of my wife and me! Everything started to shake wildly, so I just pulled back real quick and started opening up hatches because I knew I had hit something, or thought I did, from the sound of the huge explosion. My wife, Delane, yelled, “Where are the life jackets?” I started looking at all the hatches to make sure I didn’t have water coming in because of hitting something, but didn’t see anything. Well, we fouled our prop, at least one of them, and discovered it was the starboard prop. Since there was no water coming in and it seemed like we were able to move along on one engine, we continued. Trust me, one engine in 4 ft. seas is no fun. We got under the Sunshine Skyway, and it started to calm down, so I gave it the throttle. You know us power boaters, we want to get as much speed as we can. I pushed it up a little bit and we started moving a little faster. I pushed it up a little bit more and the boat rose up on plane on only one engine. This is exactly why I say people have got to get in these boats! Once I was going up on plane I couldn’t believe it. I thought, this is pretty cool, this is an incredible boat. Then, before getting too comfortable, I thought, I wonder if this is okay for the boat? So, that’s when I called you, Cindy. I got you on the phone and explained that I had just fouled one of my props, but was up on plane with one engine. You said not to worry at all as you’ve been in this situation many times. You even said I could punch it a little harder if I wanted to, and so I did. Almost everyone that has spent any time on a boat has a "fouled a prop" story, but not everyone has experienced the way a Huckins yacht can recover with ease and come up to plane on just one engine. The Huckins Quadraconic Hull played a major role in allowing the Wanderer to handle this emergency, and for that Blake can thank my grandfather, Frank Pembroke Huckins, the mastermind behind the hull's design. I let Blake know that I was really impressed with his upkeep of the boat, even after a fouled prop and all. "It really looks just like the day it came out of the shop," I told him. Buddy agreed. Our visit to the Wanderer may have come to an end, but in keeping with the Huckins tradition, the conversation and visits will continue for many years. Keep an eye out on the high seas for the Wanderer, and if your paths should ever cross, make sure you tell 'em Cindy told you to say "hi." Hey, he might even take you for a ride.